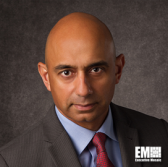 Srini Mirmira, formerly senior vice president of cybersecurity solutions at Blue Ridge Networks, has been promoted to president of the Chantilly, Va.-based company. He will efforts to implement a corporate strategy, establish strategic partnerships across vertical markets and expand cybersecurity services in his new position, Blue Ridge said Wednesday. John Higginbotham, CEO of Blue Ridge, said he expects Mirmira to help grow the company’s presence in internet-of-things and critical infrastructure markets. Mirmira’s public sector career includes time as senior adviser for international affairs at the Department of Energy, a program director at the Advanced Research Projects Agency–Energy and a consultant to Saudi Arabia’s ministry of energy, industry and mineral resources. He also held a partner role at venture capital firm RedShift Ventures.